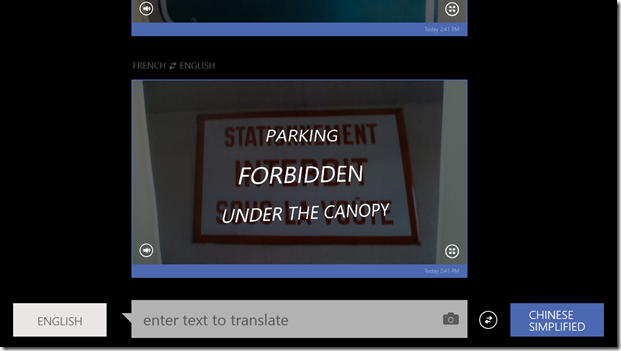 Microsoft today launched its Bing Translator app for Windows (including Windows RT). 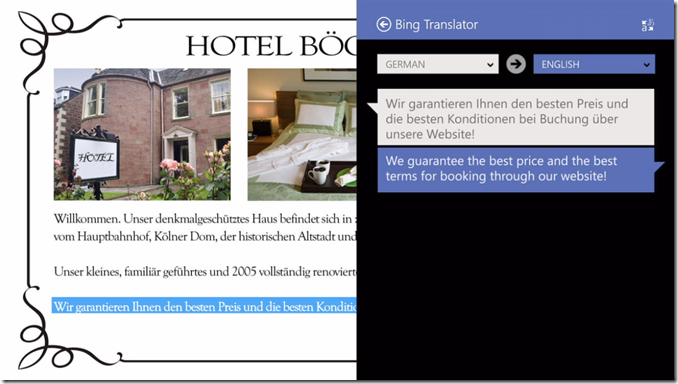 We don’t usually write all that much about Windows apps, and translation apps aren’t exactly new, either, but it’s nice to see that Microsoft has finally brought virtually all of the features of its mobile translator app for Windows Phone, including camera-based translations for seven input languages, to the desktop. Bing Translator, which is only available in Windows’ Modern UI/Metro mode, supports a total of 40 languages and also allows you to download language packs for offline use. This is par for the course for language translation apps these days. Google’s Translate for Android app also features all of these tools and supports 70 languages. The seven camera input languages include Chinese (Simplified), English, French, German, Italian, Spanish and Portuguese. The app can translate to Arabic, Bulgarian, Catalan, Chinese (Simplified), Chinese (Traditional), Czech, Danish, Dutch, English, Estonian, Finnish, French, German, Greek, Haitian Creole, Hebrew, Hindi, Hmong Daw, Hungarian, Indonesian, Italian, Japanese, Klingon, Korean, Latvian, Lithuanian, Norwegian, Persian, Polish, Portuguese, Romanian, Russian, Slovak, Slovenian, Spanish, Swedish, Thai, Turkish, Ukrainian, Vietnamese. Microsoft’s implementation of the camera-based “augmented reality” translation mode is a bit smoother, however, as it will just overlay a translation over the camera image (and you can tap to save the caption). Google Translate, on the other hand, makes you tap on the words you want to translate. Admittedly, that’s not exactly hard, but Microsoft’s approach feels a bit easier and more like what iPhone users are accustomed to from tools like Word Lens. Heavy Windows 8 users (there must be some…) will also appreciate that the app integrates with the Windows 8 “Share” charm to give you easy access to the translation tools.